“How To” Manual Preparation Guide to help you develop and implement your construction company’s Policies and Procedures manual. A construction operations manual with easily editable construction company policies and procedures manual templates will clarify your construction jobs. 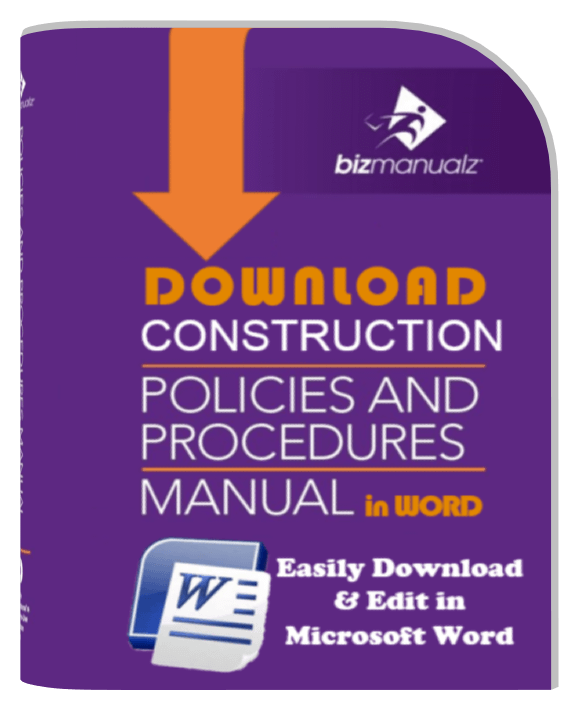 This construction policies and procedures supplement includes prewritten MS-WORD policies, procedures & forms for easier construction company management, and comes as an easily downloadable file. This supplement will assist construction companies and related firms in preparing a Standard Operating Procedures (SOP) Manual for their small to medium size construction businesses. It can be customized to fit your office staff and work crew operations. 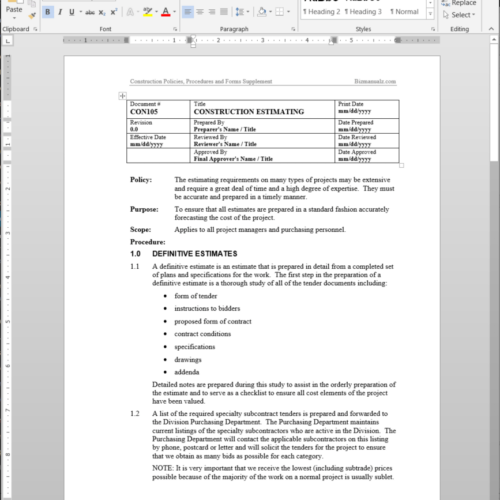 The content provides a good start for writing an Accounting Manual for construction company. 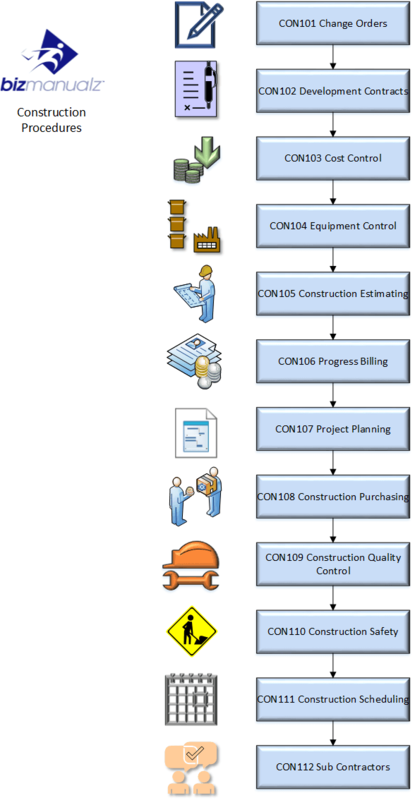 It includes cost control, progress billing, and construction purchasing. The Employee Handbook is a great beginning for a Human Resources Manual. Learn how to manage all aspects of construction operations including estimating, contracts, planning and billing and more with the Construction Company Operations Procedures Manual. 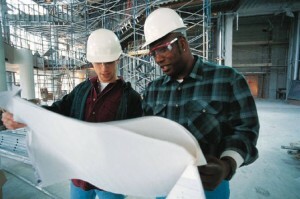 Your Business Employee Handbook contains your construction operation employee policies. It is your company’s way of informing employees of construction operations expectations, privacy practices, construction site guidelines, and the fair and equitable treatment of all employees. Your Business Employee Handbook covers all aspects related to workplace employment, benefits, and everyday employee code of conduct. The construction operations manual comes with 43 easy-to-edit Microsoft Word document policies, procedures, forms, and employee manual templates covering over 100 pages of content, combined into a convenient downloadable zip file. 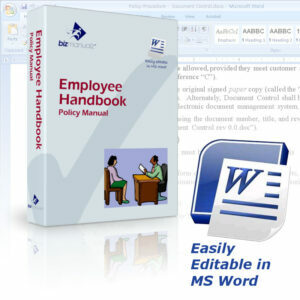 It is an excellent add-on to the Bizmanualz Business Policies and Procedures Sampler. Take advantage of this special building package and start saving yourself the time and money to develop your construction company policies and procedures manual. 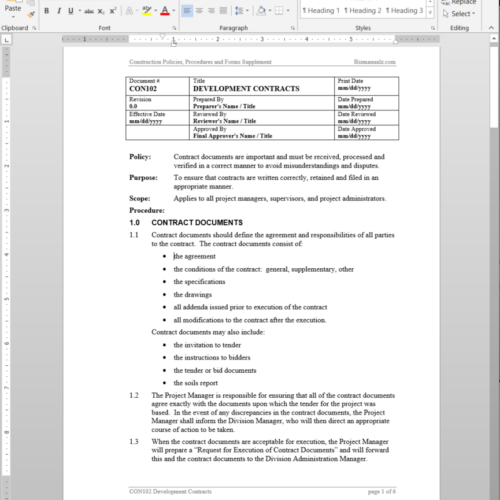 Download a Free Sample Construction Management Policy Procedure Template to get started now. Its my first purchase and need to review the supplement in details.I think it is covering most of activites of a project, need to apply them in practic to achive the maximum results. We were looking for some documentation on Estimating procedures for our Estimating department. We came across Bizmanualz as one of the only companies offering this information. I’ve only been able to read and review the content. I have not been able to begin the needed modifications, but I am very pleased with the content. I will format the TOC in a manner more to my personal liking. I anticipate that this will be a huge timesaver and I’m looking forward to starting work on this in the next two weeks.